Professionals: Concerned about women waving giant sticks of burning wacky weed around their wee toes in a desperate attempt to turn their breech babies?! Take action NOW! Ensure that these women can access support for a vaginal breech birth with an experienced, trusted professional, and you will no longer have to busy yourself trying to root out such madness! Last week the results of a trial (Coulon et al 2014) were released which appeared to show moxibustion with acupuncture ineffective in causing more babies to turn head-down. The trial had its good points. A reasonable number of women randomised (328) at the appropriate point in pregnancy (33+4 – 35+4) to use moxibustion for maximum effectiveness. This in itself was impressive, as most centres do not bother about breech presentation until 36 weeks, making recruitment for studies during this time period difficult. The team looked at the percentage of babies who remained breech at 37+2, the point when ECV (a procedure to manually try to turn the baby in the uterus to a head-down position) would be offered, and found that 72% who had the treatment were still breech, compared with 63.4% who had the placebo. They reported this was not statistically different, but superficially it looks like the treatment had the opposite of the desired effect. 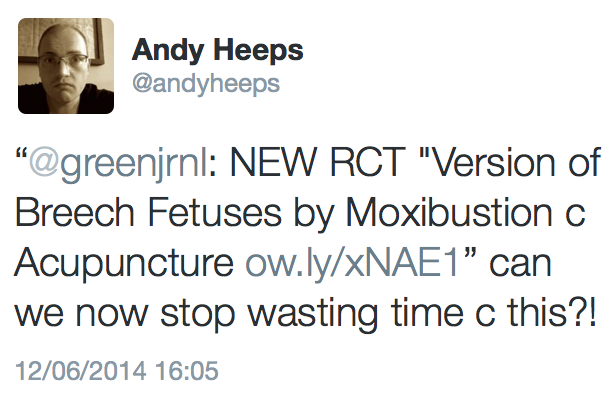 But then a woman who had actually experienced a breech pregnancy pointed out the obvious: What are the alternatives? Generally, women are highly motivated to give birth vaginally (Raynes-Greenow et al 2004, Guittier et al 2011). They instinctively feel what the research tells us – that a normal birth, wherever possible, is beneficial for both babies and women. There are many hospitals throughout the Western world, including some in the UK, where women cannot even access an ECV, let alone a vaginal breech birth. I’ve had phone conversations where I’ve asked to speak with the person who performs ECVs and been told, “We don’t do that here for liability reasons.” Folks, it’s 2014. With evidence-based counselling based on the outcomes of the Term Breech Trial, Kok et al 2008 found at least 35% of women preferred to plan a vaginal breech birth. Evidence-based counselling includes the lack of evidence of any difference between two-year outcomes whether an elective caesarean section or a vaginal breech birth is planned (Whyte et al 2004). We can reasonably conclude that if approximately 1/3 of women are not planning a vaginal breech birth in a given setting, then they are probably being directively counselled towards a caesarean section. This would include feeling forced to choose a caesarean section because no plan will be put in place to ensure attendance at a vaginal breech birth by an experienced and supportive professional. Women resort to practices such as moxibustion and handstands in the swimming pool because they are constantly given the message that breech presentation is ‘wrong’ and should be corrected, with very few alternatives. Whereas the evidence indicates that turning babies, even with ECV, does not improve outcomes for those babies, though it certainly improves the chances of a vaginal birth in settings with minimal support for vaginal breech birth (Hofmeyr and Kulier, 2012 – Cochrane Review). I am increasingly uncomfortable with the current situation, where women do things they do not actually want to do because they cannot access a vaginal breech birth at all, or will not be supported to choose that option until they have done everything else (especially ECV). Let me propose this radical solution: Why don’t we channel some of that indignation over moxibustion practices into ensuring that breech services improve to a point where women will not need to look elsewhere? Let’s ensure every woman has access to a well-supported vaginal breech birth, an ECV attempted by a highly experienced practitioner, and/or a woman-centred caesarean section as late in her pregnancy as she wishes to plan it, including in early labour. Let’s ensure that women have sympathetic, experienced counselling and continuity from a midwife while they navigate these choices, and the attendance of a highly experienced consultant, ready to step up and be that expert in complications of childbirth, backing up the team at birth. 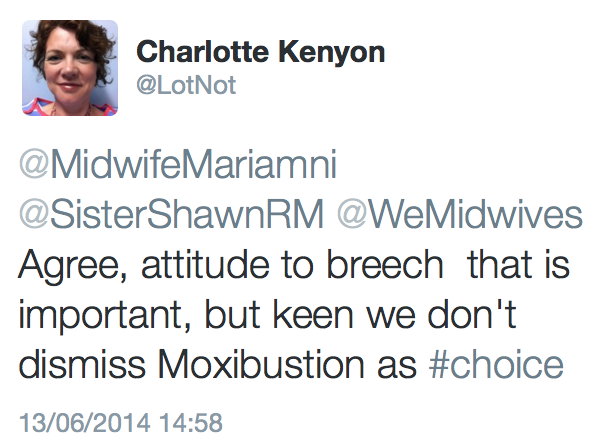 While we must always make room for those who choose a different path, I suspect that if we got a bit more comfortable with breech in general, the debate over whether moxibustion has a place in the mainstream or not would fade into the distance. Stop blaming pregnant women for their misled attempts to avoid a caesarean section, and the sympathetic midwives who are desperate to help them, and sort out primary breech services. 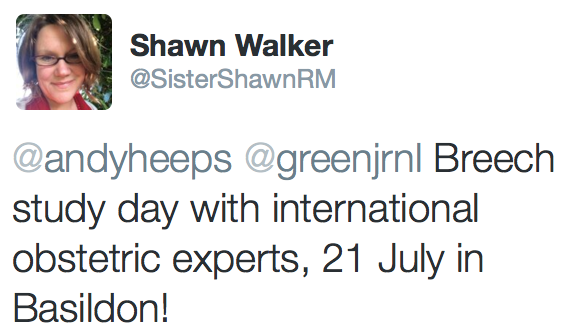 This entry was posted in Complementary Therapies, Research and tagged ECV, evidence-based practice, midwives, moxibustion, RCT on June 13, 2014 by midwifeshawn. The 35/39 trial currently being conducted in the UK (primips over age 35, at 39 wks). The ARRIVE trial on the books for the USA (all women, at 39 wks). The Dutch INDEX trial, looking at induction at 41 weeks rather than 42. The questions are valid. We know stillbirth is increased, especially in certain populations, the longer a pregnancy continues. In order to make an informed decision, many women will want to know the most likely outcomes and effects of opting in or out of proposed interventions. RCTs are considered the most unbiased way of settling these issues, unsullied by the biases of women or health professionals. The problem is, these interventions are eventually applied to a population that is, due to being human, inherently biased. Some women feel a strong preference in one direction, some in another; and some want their doctor to decide for them. Women need to consent to be randomised into RCTs, and women who are most averse to the proposed intervention simply decline consent. Therefore the population recruited becomes slightly biased towards a preference for the intervention being investigated. Is this important? Does it matter? I don’t know. Recent research by Wu et al suggests that women with a strong preference for vaginal birth were more likely to have a vaginal birth. RCTs cannot tell us the effect of women’s preferences on the outcomes they measure. Yet in theory their results are used to offer women an option they will almost certainly have an opinion about. Why do women consent or decline to participate in the RCT? Are the women who declined to participate due to a strong preference against induction more or less likely to have a normal birth? Are the outcomes for their babies significantly different than those in either arm of the trial? What are the long-term outcomes? Especially in the over-35 population, an increase stillbirth rate may be due to inherent weaknesses in the baby. Significant long-term differences are often not detectable until 2 years of age. And finally .. would they do the again? Would they recommend it to a friend? These are questions best answered using quantitative techniques, but women may have different questions or priorities, which we will only discover using qualitative investigations. 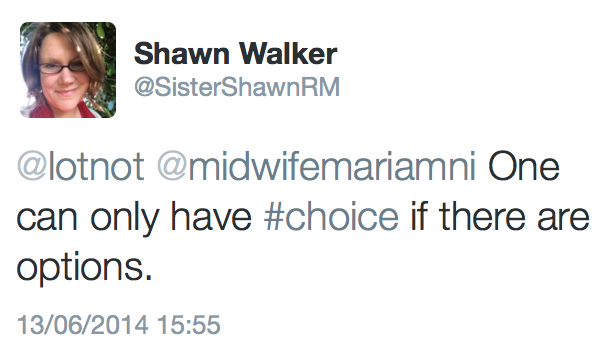 See Part 2: Why midwives are sceptical. 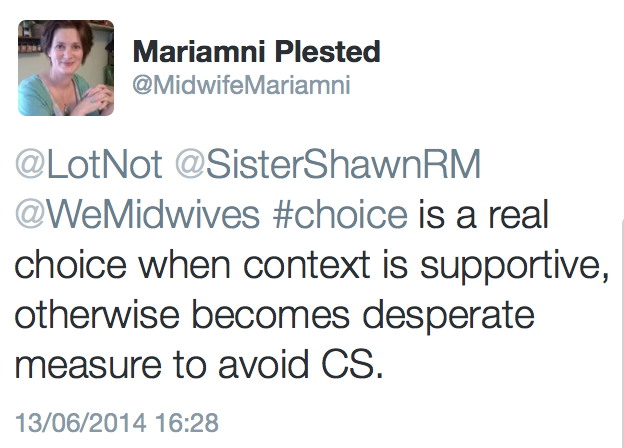 This entry was posted in Research and tagged induction, informed consent, IOL, RCT, research bias on January 19, 2014 by midwifeshawn.